I made full use of my previous night's motel room in order to catch up on my sleep and my email, then after breakfast I headed out of town for my last few miles of cycling through Kentucky. After about an hour of riding I began to approach the ferry landing and it was clear that the road and surrounding fields had been submerged until only recently. Not surprisingly I was the only cyclist on the ferry and I ended up talking to about six different people during the short ride across the Ohio River into Illinois. Before long I had gotten all sorts of suggestions about what was the quickest way to my next destination and I had also been given a road map of the entire state of Illinois, just in case I were to get lost. After the ferry landed I continued along my planned route, which also happened to be the route that consensus on the ferry had judged the best. What nobody had known, or at least told me about, was that a bridge I needed to pass over was currently submerged by the high waters. 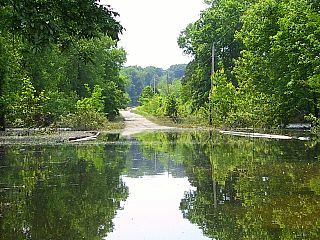 But as I rode along Tower Rock Road I came to a sign announcing the road was closed and a flooded bridge a hundred yards beyond. The water over the bridge wasn't flowing, and I considered for a few minutes simply carrying my bike and gear to the other side. I could have easily forded the four-foot deep still waters, but it would have taken time to separate my gear from my bike and carry everything across. I also would have ended up soaked from the waist down in mucky water so I opted to backtrack and take a detour instead. I didn't have to retreat too far down the road before I found an alternative that took me north and then another that took me west and linked me with the original route. I estimate that the detour added at most an hour to my ride, and considering that it would have taken at least 20 minutes to ford the river and repack my bike that was no great loss. I had left the day’s destination somewhat open when I began riding this morning. I planned to ride at least as far as Golconda, then decide from there if I wanted to camp next to the river or continue pressing on to a later campground. But as I neared Golconda the wind began to stiffen and the sky darkened and I started to feel as if my mind was being made up for me. 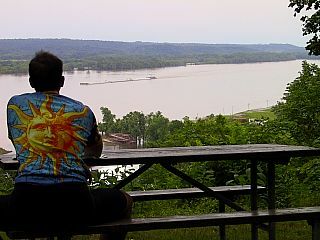 But when I got to my intended campsite, a recreation area on the banks of the Ohio River, I found that it was closed presumably due to the high water levels. The next possible campsite was another ten miles down the road, and although I probably could have made it there before sunset I feared that would be pushing it. I decided to go around the locked gate of the campgrounds I was at to at least see if I could refill my water bottles before heading on. The campsites ended up being atop a hill that overlooked the river, and I couldn't see how rising water levels could present any sort of risk to me whatsoever. Between the approaching sunset, the darkening sky, and the seclusion of the hill, I decided to go ahead and pitch my tent for the night. As I write this update I'm sitting inside my tent with the rain pouring down and lightning crashing around me. Great journal. Glad to read that your adventure is going well. I'm jealous. I may have to find something cool to do this summer, too. You're doing an awesome job. I love the pictures you've taken....everything is so GREEN. I just want you to know that all of your stuff is doing fine. Some of the plants have perked up, although others aren't doing quite as well. I'll keep trying to keep them alive for you. :) You're furniture fits pretty well in the house...so you may have to fight to get it back. Ha! Anyhooo, keep up the good pedaling and call us if you want us to pick you up when you get near to Fort Collins.